PENSACOLA, FLA. - (February 8, 2012) - Introducing two new groundbreaking products, new building information models making it easier for architects to integrate Hy-Lite products into their projects, a brand-new comprehensive catalog, a newly redesigned Web site and social media portals, Hy-Lite's booth at IBS 2012 will be overflowing with new information. DecoGuardTM is the first hurricane impact-resistant decorative glass window in the industry. Offering stylish protection from the harsh weather conditions associated with hurricanes and tropical storms, DecoGuard is the ideal window for safe and luxurious coastal living. The 48-inch square designer window starts with a heavy-duty vinyl frame and impact-resistant laminated insulated glass. 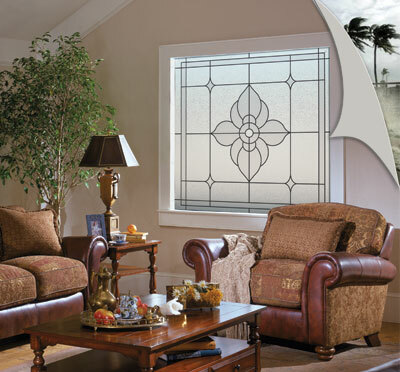 Add in an elegant floral pattern kiln-fired directly onto the glass, dramatic black lines and rich, frosted privacy glass and the result is a beautifully safe window no coastal home should be without. Also new from Hy-Lite is an in-swing egress casement-style window featuring sparkling acrylic blocks. A perfect mix of beauty, form and function, this new window offers up the practicality of meeting egress code requirements while providing privacy and elegance. As an added bonus to homeowners, these privacy windows also replace the dreaded window-well view with the beauty and style of acrylic block. Available in both new construction and replacement frames, the energy-efficient double- and triple-paned egress windows can be custom-sized to fit virtually any rough opening. Newly published building information models (BIMs) for use with Revit Architecture software from AutoDesk make it easier than ever for architects to insert acrylic block and decorative glass windows from Hy-Lite seamlessly into their designs. The information is available to architects via free download at www.hy-lite.com. For easy access to complete information online, check out the completely redesigned company Web site at www.hy-lite.com. Designed to fuse the previously-independent U S Block Windows, Inc. and Hy-Lite Products brands into one for a more simplified browsing and shopping experience, the new site is friendlier, with a more modern look and feel. Easy-to-navigate sections cover all product offerings, information on where to buy, technical performance information as well as a new media center. Look for a brand-new, 52-page color catalog of all Hy-Lite's privacy window offerings making its debut at IBS 2012. Featuring stunning photography and comprehensive product specifications, the catalog is ideal for consumers, builders, architects and all others interested in these eye-catching privacy window products. Pick up a copy in the Hy-Lite booth (#W2721), or order one online at www.hy-lite.com. In addition to the new DecoGuard and in-swing egress casement windows, the Hy-Lite booth at IBS 2012 will feature a broad range of privacy window product offerings including acrylic block door inserts, interior acrylic block shutters and fully-operable decorative glass windows in many shapes, sizes and specifications. Headquartered in Pensacola, Fla., Hy-Lite, a U.S. Block Windows Company, offers the widest selection of prefabricated privacy products in the industry. Product lines include a variety of operable and fixed acrylic block and decorative glass windows. Additional product offerings include glass block windows along with an assortment of acrylic block shutters, accent panels, radius walls, partition walls, door inserts and shower kits. For more information, please visit us online at www.hy-lite.com; on Facebook at Hy-Lite; on Twitter at @HyLite_Windows; or call 888-256-2599.